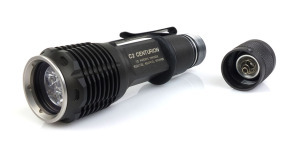 As with other P60-based SureFire lights, the 6Z and Z2 have been very popular with enthusiasts due to the ease with which they can be upgraded using any of the numerous P60 LED drop-ins available. However, since SureFire discontinued production of the Z2 they have become scarcer and are typically only available on the used market. That is, until now. The OVEREADY 6Z and Z2 are available with a choice of black or natural gray hard-anodized finishes and can be purchased as a host (with no light engine) or as a turnkey flashlight outfitted with a TorchLAB Triple LED drop-in (Review) or M2 Mini TurboHead (Review) already installed. A selection of switches, lenses, and bezel rings provides additional options for configuring the OVEREADY 6Z and Z2 in a number of different ways. Samples of the various components, with black hard-anodized finish, were provided by OVEREADY for this review. Since performance will vary depending upon the drop-in used, this review will focus on the host itself. The same body is used regardless of configuration. Beginning with the body from a brand new SureFire 6P Original, the center portion is machined to match the diameter of the 6Z and Z2. The resulting surface is smooth but not slick due to the fine texture left behind from the machining process. The corners at each end of the body are radiused to flow nicely into the head and tail. In the 6Z configuration, a Smoothie bezel and Diamondback tailcap are used to stay with the perfectly round design of the classic light. For the Z2 look, a custom hard-anodized Z44 bezel and Z41 tailcap are used keeping with the design of the more recent CombatLight. A wide selection of bezel rings are available to customize the appearance of the light including copper, black steel, brass, silver, and titanium as well as crenelated stainless steel versions. Switch options include the stock SureFire Z41 “twisty” switch, “McClicky” click-type switch, ZeroRez Twisty, and ZeroRez Mounty. There are also three different lenses (windows) to choose from: Stock SureFire Pyrex/Borofloat, Ultra-Clear glass, or frosted glass. As with their other custom hosts, the OVEREADY 6Z and Z2 body is bored to accept high-capacity 18mm (nominal) diameter lithium-ion rechargeable batteries. Double O-rings are used at the tail in place of the single O-ring used by SureFire. A battery retention lip with rubber O-ring bumper at the head keeps the battery (or batteries) in place when the bezel is removed. 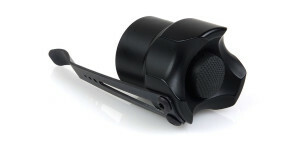 The custom hard-anodized finish extends to the inside of the bezel, tailcap, and battery compartment. 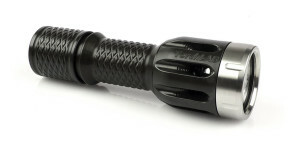 As I have come to expect from OVEREADY, the hard-anodized finish is smooth and consistent across all parts of the light. Where the Type II finish on the SureFire Z2 is somewhat glossy, the hard-anodized OVEREADY 6Z and Z2 have more of a matte finish. The refinishing process is quite involved and requires several steps. To learn more about what goes into the creation of a custom hard-anodized host, visit the Fire Red 6P Review. The rubber grip rings that were used on the SureFire Z2 are not available for purchase and are not included with the OVEREADY 6Z or Z2. 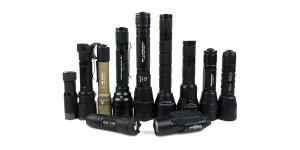 The OVEREADY 6Z and Z2 provide options to those flashlight enthusiasts wanting a high-performance P60 host with the distinctive design of the SureFire 6Z or Z2. With the ability to use 18mm batteries and the available switch upgrades, the 6Z/Z2 is capable of getting the most out of the most powerful light engines such as the OVEREADY Triple or Mini TurboHead. Of course it’s not all about performance as the 6Z/Z2 retains compatibility with the huge assortment of accessories and add-ons designed for the SureFire 6P, allowing the light to be configured, or reconfigured, almost at will. 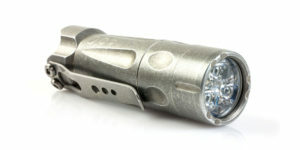 While the light functions fine without the rubber grip rings, some users may want to find something that resembles the feel of the original SureFire lights. 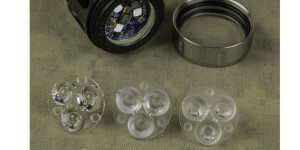 Aside from “borrowing” a set of grip rings from another light, rubber O-rings of varying sizes may be used to provide a similar result. Alternatively, the narrower portion of the body works well with a paracord lanyard, either at the tail or along the entire length of the body. Pricing varies according to selected options and begins at around $140 for the 6Z host and $150 for the Z2. For more information about the OVEREADY 6Z and Z2, visit the OVEREADY website or use the links to specific items below. Posted in Flashlight Reviews, OVEREADY and tagged OVEREADY, Surefire.